On the streets of New York, darkness and violence reigned. Dimas “Daylight” Salaberrios began selling drugs when he was eleven years old, and by sixteen, he had served his first stint at the notorious Rikers Island prison. Dimas saw only one way to survive: by reigning over the streets. He would be the richest, most powerful ruler in the hood . . . or die trying. Street God is the true story of one man’s dangerous journey through the underworld of crime, drugs, and almost certain death. It was an encounter with the real God that saved his life — and then made it even more dangerous. Because that God sent Dimas back down the darkest streets he’d ever known — with other lives depending on it. And Dimas had to ask the question: How far am I prepared to go? A dramatic, compelling memoir full of twists and turns, Street God delves deep into a world from which few ever emerge — and shows how a single spark of light can illuminate even the darkest existence. I don't often read biographies or memoirs, but this one sounded good enough to pique my interest. 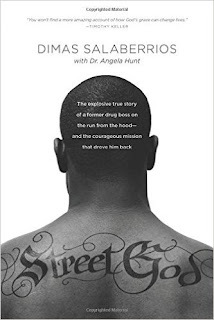 It gives an inside look into the gang life, and the life of drug dealers, and it is an amazing story. One wonders after reading the book how on earth this man stayed alive going through what he went through. Written in the first person, this book has more drama and excitement than a lot of fiction books. The author starts his story when he is a young kid just getting into the gang and drug scene and takes the story up and past when he became a Christian. This is an amazing story, and it should give anyone hope that God can indeed reach anyone. After reading Dimas' story, I am amazed a young man like that could turn to Christ and have a life like that redeemed and changed. The book is an interesting and fascinating read that is hard to put down. I highly recommend it. As a worldwide missionary, teacher, and speaker, Pastor Dimas Salaberrios has shared the Gospel of Jesus Christ on every continent but Antarctica. He aided pastors in Kenya and smuggled Bibles to the persecuted church in China. In 2010, Dimas and his team provided over 50,000 tons of food, water, and supplies to Haiti after a massive earthquake and in 2012 he worked as a first responder to provide aid and deliver nearly $500,000 worth of supplies to super storm Sandy victims across NYC. Partnering with Tim Keller and Redeemer City to City, Dimas founded Infinity NY Church, planted at the Bronx River Housing Projects in 2006. Infinity Bible Church targets at-risk, gang-ridden youth and has spearheaded numerous outreach events, discipleship groups, and weekly prayer walks, which have been a factor in virtually eliminating homicides and other violent crimes at Bronx River. Police Commissioner Raymond Kelly credits Pastor Dimas and Infinity for the notable drop in crime. Additionally, the Billy Graham Evangelical Association (BGEA) appointed Dimas to co-chair the Youth Committee in 2004, and serve on the budget and finance committee for their 2005 Greater New York Crusade. He coordinated the BGEA Prayer Breakfast, and during the Saturday evening service of the crusade he spoke to an audience of 100,000. In 2012, Dimas played a central role in the New York City "Right-To-Worship" movement, which ignited cross-congregational prayer gatherings throughout the city and sought to protect over 17,000 church congregants from unwarranted eviction from rental spaces owned by the city of New York. In October of 2013, Concerts of Prayer Greater NY (COPGNY) unanimously chose Pastor Dimas Salaberrios as its new president. He has served on the COPGNY Board of Directors for several years. On weekdays, watch The Dynamic Life with Pastor Dimas on the Word Network and tune into his national radio broadcasts on Salem Communications. To find broadcast schedules, log onto www.pastordimas.com. Dimas holds a Master of Divinity degree from Alliance Theological Seminary and resides in the Bronx with his wife Tiffany. They are blessed with three beautiful daughters: Shirley Ann, Dallas, and Skylar. Street God is available from Tyndale Publishing. Miracle Drug by Richard Mabry, M.D.